Way out in the middle of freakin nowhere. Seen one dry lake bed, ya seen 'em all? Not quite. This bizarre lunar scape makes you scratch your head "what on earth?" 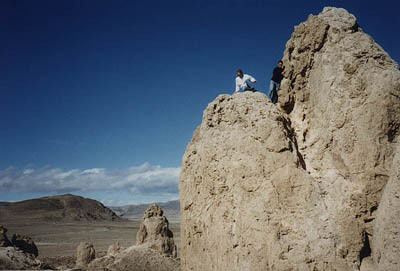 From Southern California on the way to Death Valley, this is a perfect stopping point for sightseeing. From the North Mojave desert meca of Ridgecrest US Hwy 395, take Hwy 178 Eastbound. After you pass the right hand turn off for Johannesburg, continue straight on Hwy.178 for an additional 7.5 more miles. Blink & you will miss the Pinnacles turn off. 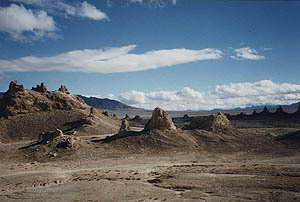 While speeding along the drab desertscape, SLOW DOWN to look for the "Trona Pinnacles" sign & take a right on the dirt road. Regular passenger cars can make it (slowly), but watch out for the bumps & dips. This road is not advised in wet weather. It can literally become lake (again) in heavy rain. Know the weather forecast before you decdie to sleep out here. Winds can get mighty strong and thunderstorms are possible.